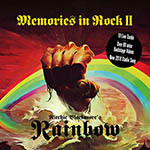 After the successful 2016 performances in Germany (Monsters Of Rock) and UK, Ritchie Blackmore's Rainbow played in June 2017 three UK concerts, which were recorded for the present double CD. The legendary guitarist and his men - Ronnie Romero (vocals), Jens Johansson (keys), Bob Nouveau (bass), David Keith (drums), Candice Night and Lady Lynn (backing vocals) - have a first class mix of Rainbow at these concerts - and Deep Purple classics played. Anyway, Ritchie Blackmore's guitar playing is beyond any doubt, but even Ronnie Romero's incredibly strong rock tube is likely to convince even the biggest Dio, Bonnet or Turner fan. In addition to the 19 live tracks in outstanding sound quality, this release contains two other delicacies that will delight all fans: A brand new Rainbow Song, 'Waiting For A Sign', as well as a DVD with over 80 minutes of interviews with all band members, an additional backstage clip and a video clip for the 2017 studio version of 'I Surrender'.